1. Heat oven to 375 degrees F. Coat a 13 x 9 x 2-inch glass baking dish with nonstick cooking spray. 2. Cut 1/8- to 1/4-inch thick lengthwise slice from each zucchini. Chop the slices and reserve. 3. Using a melon baller or small spoon and starting from cut side, scoop out most of flesh from each zucchini, leaving a shell. Chop together the flesh and add the reserved chopped slices. Reserve the zucchini boats. 4. In large nonstick skillet, heat oil over medium-high heat. Add chopped bacon; cook 3 minutes. Stir in chopped zucchini mixture, onion salt, garlic powder, nutmeg and cayenne; cook, stirring occasionally, 7 minutes. Remove from heat. Stir in bread crumbs and 3/4 cup of cheese. 5. Spoon about 1/2 cup filling into each zucchini boat. Place in prepared baking dish. Add 1/4 cup hot water to dish; cover dish with foil. 6. Bake in 375 degree F oven for 25 minutes. 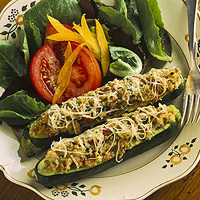 Uncover; sprinkle tops of zucchini with remaining cheese. Bake, uncovered, for 5 minutes or until cheese is melted. Makes 6 servings.